Geodetic measurements provide valuable information on the magnitude and sense of displacement occurring on the Earth’s surface. One geodetic technique is Interferometric Synthetic Aperture Radar (InSAR), a repeat pass radar remote sensing technique that is capable of measuring small-scale changes in topography. Such measurements can be used to constrain deformation kinematics across the seismic cycle, an important part of which is post-seismic deformation. Post-seismic deformation can provide insight into the rheology of the crust and upper mantle, frictional properties of faults, and the effect earthquakes may have on nearby faults. The 2013 Mw 7.7 Balochistan, Pakistan earthquake was unusual in that it ruptured a 200 km segment of the Hoshab fault, a reverse fault, with almost pure strike-slip motion. Time series over the Makran Accretionary Wedge captures a deformation transient in the hanging wall of the Hoshab fault, and my project seeks to quantify if afterslip or viscoelastic relaxation is the cause of this signal. We generate a suite of forward models to examine what mechanisms (viscoelastic relaxation, afterslip) are acting at depth and what rheological conditions best fit the InSAR observations. 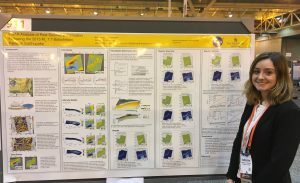 The Makran Accretionary Prism is not well understood, and this study will provide first order constrains of the structure and rheology of the region.